Nicolas Cage loses his shi(r)t.
I’ve been succumbing to DVD-binges on Amazon, and putting my local independent DVD supplier out of business. To assuage my guilt, I’ve bought only the cheapest DVDs, and consequently have a random bargain bucket of Cage films set to arrive at my door sometime in the next two weeks. These are they, two a penny Cage’s for an insatiable generation. Windtalkers. The cheapest at one penny plus postage and packing. We have to break the action film barrier at some point. Honeymoon inVegas. This one is in the ‘passion’ part of the Venn diagram, so it’s sure to be interesting. Snake Eyes. Probably going to give this one to Adam. Guarding Tess. She employs him as a bodyguard, even though she hates him! Looking forward to this. Perhaps a Christmas day film? The Family Man. Some kind of hangdog morality tale, maybe? I suspect I’ll be watching this one alone. Also we still have The Wicker Man, star of a hundred youtube clip videos yet to watch and add our own vital commentary to before your astonished face! Absent-minded street thugs and other business. Adam has bought ‘Bringing out the Dead’ and I have ‘The Boy in Blue’ waiting to be watched and reviewed. I also have a copy of ‘The Wicker Man’ (Director’s Cut: More Evil Awaits Inside) which we’ll save for a special treat some time in the next few weeks. 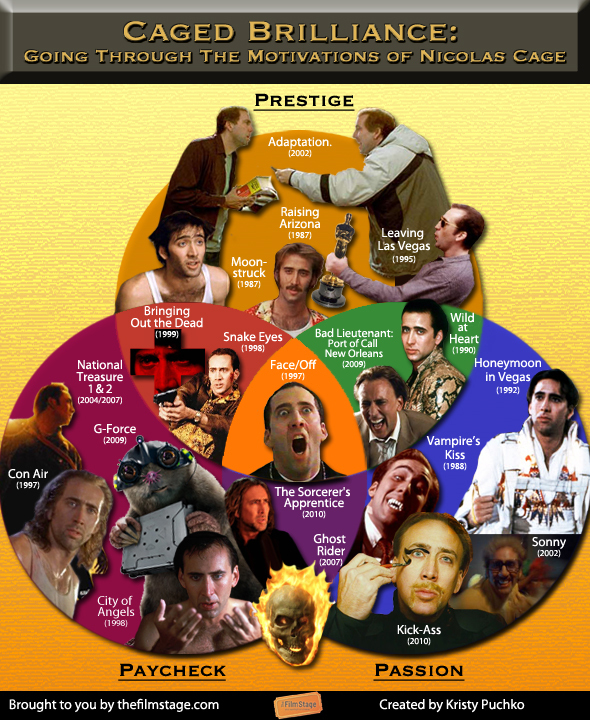 In the meantime, here’s a Nicolas Cage variety show of movie taglines copied from IMDB. Some of them are pretty special. First person to match them all up correctly wins Nic Cage singing ‘Love me Tender’ to them with a plastic nose on his nose. A former First Lady of the US wants a particular Secret Service agent to head her bodyguard detail, even though he can’t stand her. This is the utopia we are aiming for.